Scarsdale is a rural village on the Glenelg Highway, 22 km south-west of Ballarat. The origin of the name is unclear: it was possibly the name of a gold prospector in the district, or it is descriptive of a valley or dale at the bottom of a rocky outcrop. Gold was found in the vicinity of Scarsdale in 1856, mainly on a semi-circular alignment which coincided with Brown’s diggings about 2.5 km east-north-east of Scarsdale. The diggings were developed towards the end of the 1850s, and Scarsdale’s best gold years were 1861-64. Mining continued until the 1900s however. The district’s first school was an Anglican one (1856) at Brown’s diggings, and a school was opened in 1861 at Scarsdale. Settlement was concentrated at the latter, extending southwards to the extent that an adjoining settlement was named Newtown. On 25 July 1862, the borough of Brown’s and Scarsdale was proclaimed, extending southwards to Cape Clear. Scarsdale acquired an array of industries and civic bodies. There were Anglican, Presbyterian and Methodist churches, and a Wesleyan church in Newtown; industries included two foundries, two brickfields, a brewery, a tannery and several hotels. The country was described as elevated and rangy in Bailliere’s Victorian gazetteer (1865). 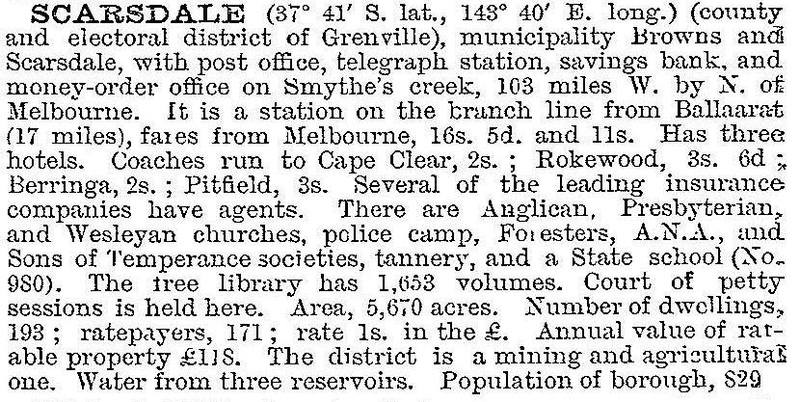 In 1883 Scarsdale was connected to Ballarat by railway and extended westwards to Linton in 1890. There was also a station at Newtown, and in 1911 the line was extended southwards from there to Cressy. During 1910-20 the borough’s population more than halved to about 230 people and on 1 October 1915, it was united with Grenville shire. Scarsdale-Newtown’s original linear shape is still visible by the scattering of buildings along the Lismore-Scarsdale Road. The Anglican and Methodist churches closed in 1971 and 1953 respectively, and the Presbyterian church continues. A handsome post and telegraph office is a private residence and a mechanics’ institute was moved to Sovereign Hill in Ballarat in 1972. There is also a general store, a hotel, a hall and a school which is the Scarsdale campus of Woady Yaloak (c50 pupils, 2014).